The H2gO Purifier is the result of a team of researchers and engineers working to create the best personal water purifier in the world. H2gO is a pocket-sized water purifier for individuals, families, and small groups that uses a state-of-the-art process called electrolysis to convert brine into a sterilizing solution. Most city water utilities use the same core technology. The H2gO is effective, economical, and easy to use. It is virtually free to operate, requiring only common salt to make the brine. The device can be charged via the integral solar panel or micro USB port. Each full charge of the H2gO Purifier PRIME easily purifies 150 liters (40 gallons) of potable water and over 60,000 liters (16,000 gallons) before the battery starts to become less useful, and the H2gO Purifier GLOBAL purifies 300 liters (80 gallons) of potable water per charge and over 124,000 liters (32,000 gallons) over its useful life. Quickly mix a brine solution in the included brine bottle. Add any type of salt (including common table salt) to the fill mark, fill to the top with any type of water, then shake. The bottle holds 12-15 applications. Pour the brine into the electrolytic cell chamber, select your treatment volume, and activate the device with a couple clicks of a button. Within 15 seconds to 5 minutes (depending on volume selected), the disinfectant is ready with no pumping, stirring, or shaking required. 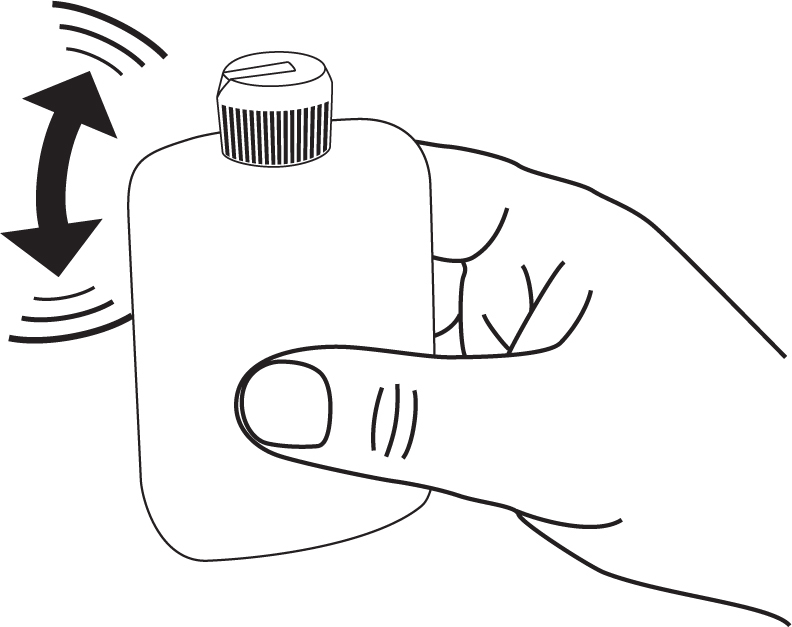 Add the few drops of disinfectant to your water container, wait about 30 minutes, and then drink. It is that simple. *Idependent testing confirms virus and bacteria inactivation in accord with the World Health Organization (WHO) Household Water Treatment Scheme (HWTS). The device is compliant with the EPA Guide Standard and Protocol for Testing Microbiological Water Purifiers and is registered with the US EPA as demonstrated by significant microbiological test protocols. 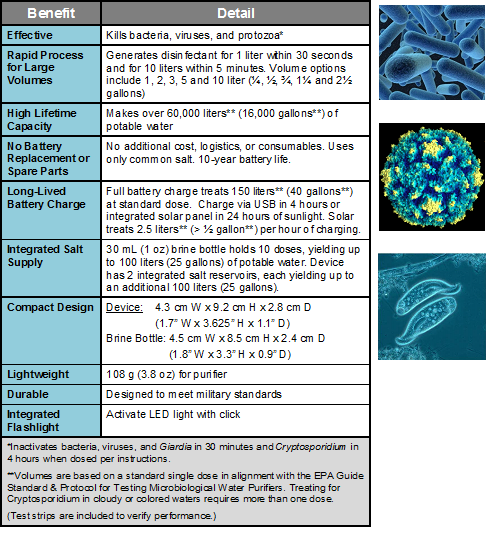 Current instructions for inactivation of Giardia and Cryptosporidium follow the same protocol that the 1st generation purifier (MSR/MIOX Purifier) used to pass EPA standards. Refer to dosing protocols spelled out in detail in the instructions included with each device. Available to retailers in the U.S. and worldwide and to non-government organizations (NGOs). Click here to buy now. To download an information sheet for the outdoor and traveler market, click here. To download an information sheet for the military, click here. To access the Operations Manual for the H2gO Purifier PRIME, click here. To access the Quick Start Guide for the H2gO Purifier PRIME, click here. Designed for developing nations; available to NGOs anywhere and outside the U.S. for commercial and government sales. Click here to buy now. H2gO Purifier GLOBAL delivers a 2.5 mg/L dose with a maximum treatment volume of 20L, in alignment with CDC Safe Water System requirements common in developing nations. (The CDC Safe Water System incorporates a 20L countertop container and bottled chlorine, which has been demonstrated by numerous agencies to save lives. Safe Water System users are instructed to add a single capful of chlorine to clean-looking water and two capfuls to dirty-looking water, with each capful providing a 2 mg/L FAC dose.) The H2gO Purifier GLOBAL can be used in place of bottled chlorine, eliminating degradation issues, ongoing cost, and the logistics of transporting disinfectant. The World Health Organization (WHO) has established a standard for Household Water Treatment Systems for developing nations. This is known as the WHO Household Water Treatment Scheme. 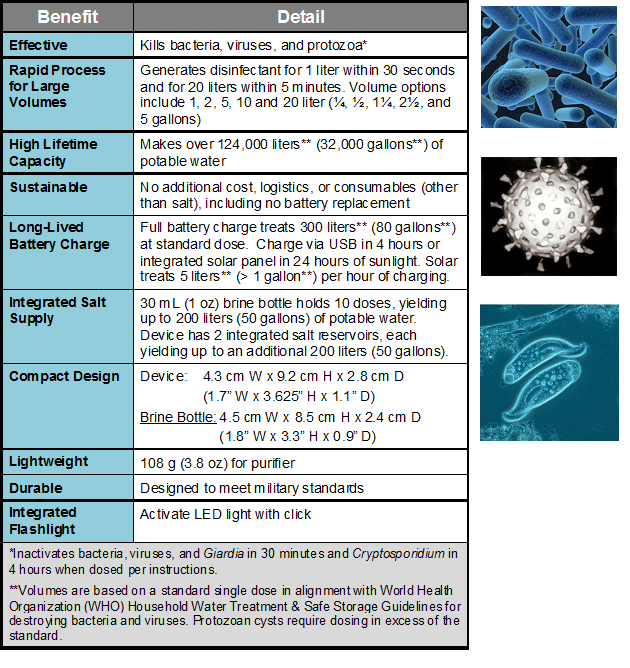 We have been advised by WHO that we meet the “limited protection” category for the H2gO Purifier GLOBAL, which meets treatment standards for virus and bacteria with a single 2.5 mg/L dose. Our internal tests show that multiple doses will also inactivate protozoan cysts like Giardia and Cryptosporidium if filtration is not available. At the time we submitted information for the WHO HWTS scheme, we had not yet developed the dosing protocol for protozoa. Hence, we are listed in the basic category under the HWTS scheme. For a current status on our certifications with WHO, visit http://www.who.int/household_water/en/. To download an information sheet for developing nations, click here. To access the Quick Start Guide for the H2gO Purifier GLOBAL, click here. To access the Operations Manual for the H2gO Purifier GLOBAL, click here. For orders of 2,000 or more, we are able to customize a device to fit your market. For example, H2gO Purifiers used in Haiti are programmed to offer only the commonly used volumes of 1 gallon and 5 gallons, while the overlay is in the Kreyol language. In addition, a graphical instruction poster was designed for users to hang in their homes. If you are interested in a custom design for orders of at least 2,000 units, contact us at info@h2gopurifier.com. Limited Warranty, Aqua Research LLC (“AR”) to the original owner (“Owner”) under intended use and maintenance, warrants the enclosed product (“Product”) to be free from defects in materials and workmanship for two years. No warranty against defects in materials and workmanship will apply if Product is (i) altered in any way, (ii) used for purposes inconsistent with Product’s intended purpose or design, or (iii) improperly maintained. Warranty will furthermore be voided where user (i) failed to follow Product instructions or warnings, or (ii) subjected Product to misuse abuse or neglect. During the warranty period, original Product parts determined by AR to be defective in materials or workmanship will be repaired or replaced as Owner’s sole remedy. AR reserves the right to replace any discontinued Product with a new Product of comparable value and function. EXCLUDING THE LIMITED WARRANTY PROVIDED ABOVE, AR, ITS AFFILIATES AND THEIR SUPPLIERS, TO THE MAXIMUM EXTENT PERMITTED BY LAW, MAKE NO WARRANTIES, EXPRESSED OR IMPLIED, AND DISCLAIM ALL WARRANTIES, DUTIES AND CONDITIONS, WHETHER EXPRESSED, IMPLIED, OR STATUTORY, WITH RESPECT TO THE PRODUCT, INCLUDING WITHOUT LIMITATION ANY IMPLIED WARRANTIES OF MERCHANTABILITY, AGAINST LATENT DEFECTS, FITNESS FOR A PARTICULAR PURPOSE, OR CORRESPONDENCE TO DESCRIPTION. Warranty Service. To obtain service under this warranty, the warranty-eligible Product must be presented to an AR authorized dealer. In the United States and Canada, warranty service may also be obtained by email request to service@h2gopurifier.com. Owner is responsible for all costs associated with returning Product to AR for service. Where at its sole discretion, AR deems product eligible for warranty repair or replacement, AR will pay the shipping and handling associated with returning repaired or replaced Product to Owner. In instances where AR deems a returned Product eligible for warranty service, AR will, if possible, repair Product for a reasonable charge that includes return shipping and handling. For warranty return service details, please go to www.h2gopurifier.com. Limitation of Remedies. Should a court of competent jurisdiction find the limited warranty set forth above breached, AR’s only obligation will be to, at its option, either repair or replace Product. Should the aforementioned remedy fail of its essential purpose, AR will, in exchange for return of Product, refund to Owner Product’s original purchase price. THE FOREGOING REMEDY IS THE SOLE AND EXCLUSIVE REMEDY OF THE PURCHASER AGAINST AR, ITS AFFILIATES AND THEIR SUPPLIERS, REGARDLESS OF LEGAL THEORY.